Marquette University Law School's study abroad programs provide its students with the unique opportunity to benefit from extended stays in other countries around the world where they can immerse themselves in different cultures and legal systems and learn from international faculties and classmates. It is an obvious truism that seems to become more true every day that challenges to our economies, security and the health of our natural environment are often global in nature and require global solutions. The practice of law reflects that fact as countries address those challenges with additional treaties, and as business expands into new markets and more people immigrate to new countries. The Law School encourages its students to spend time studying abroad through a number of programs. 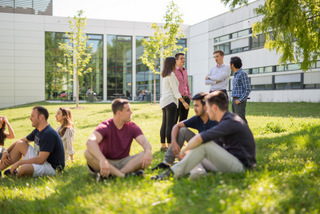 Law School students can enroll in the Law School's own Summer Study Abroad program in Giessen, Germany, run in collaboration with the University of Wisconsin Law School and Justus Liebig University Law School in Giessen. One of the Law School's own semester exchange programs with foreign universities: University of Copenhagen, Comillas University (Madrid), and University of Poitiers. Credits awarded by other law schools transfer only with grades of satisfactory or unsatisfactory. To earn a grade of satisfactory, a student must earn the equivalent of a C. All classes taken in programs sponsored by law schools other than Marquette must also be approved in advance by the Law School’s Director of Study Abroad Programs. Financial Aid for all study abroad programs generally is available under the same terms as financial aid for any course of study at the Law School. For further information, contact Professor Alan Madry, Director of Study Abroad Programs, or Professor Ed Fallone. Students may also serve as interns, sometimes for academic credit, with human rights and humanitarian organizations operating in foreign countries either through their own initiative or through relationships created by the Law School and its faculty.